Just thought I would share a small project I have been working on for myself. I made quick reference sheets for when I forget what I mapped where, and as a emergency backup if my profiles break. This now gets copied to a “control” section which merges the text for multi-direction buttons into one field, which can then be places in a text box. As this is a cloud copy of mine, any updates I make can also be found at this same link. … i think the target software can generate those for you! there’s a print function inside it! I think the result is similar if i understood what you are doing! I never bothered with TARGET. These are a direct display of what I have entered in the DCS controller settings. I opened up TARGET - it’s lets me print a sheet labeling the buttons by their windows assignment (button 1, 2, 3 etc.) and setting up a dummy profile just allows keyboard mapping which isn’t useful to me (save maybe making a 1-click eject button) and it doesn’t go per-aircraft in DCS by the aircraft’s function. The purpose of my sheet is so when I read the guide and it says “use sensor select switch ” I can say “okay, thats assigned to the sticks TMS switch”. Helps with the Harrier a lot, it’s systems don’t seem as natural to me to stay in memory long, and the Sabre which doesn’t have that complex a HOTAS to crossover, so the “extra” buttons get mapped to things on other panels, like the gun selector. 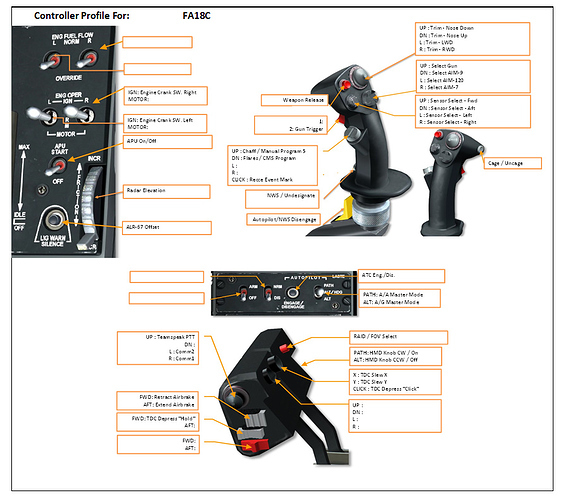 I have your controller page for the F/A-18C on my desk! Are you going to release this to the public? I was going to clean it up a bit more, but I haven’t gotten to it. Functionally it is working though - so you can download it via the link in the first post, which I just edited in. If I make any updates, I will refer back to that link as it is a OneDrive cloud copy of my actual document - so it will update as I go. Added missing throttle detent control labels. Added missing Flaps Switch control labels. Boxed in “Profile For” cells. Adjusted multiple label boxes to remain connected to arrows. Updated version available via same link in original post. 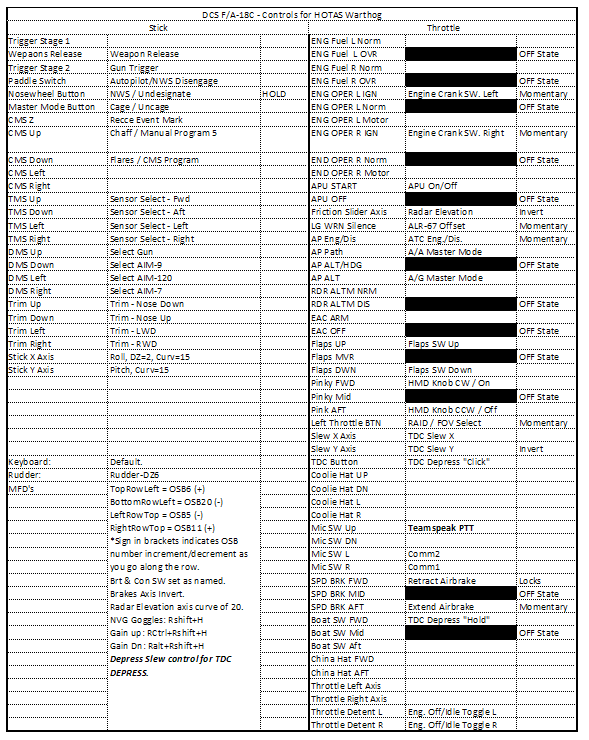 Added pages for F14BPilot and F14BRio. The Pilot page is all basically setup, but needs some refinements. This profile is mainly the default from Heatblur, with some re-mapping of the Wingsweep to the CoolieHat and the MicSwitch given it’s intended function. Stick curve may be increased to allow a larger smoothing zone, as the Tomcat requires better input control from the pilot and reacts harsher to “oversteering”. The RIO page is current just a copy of the Pilot page - I will add my mappings in the coming days as I figure them out. For anyone making use of this, the sheet is at least there for you! Hornet Update: Not any major changes, I am testing a non-axis assignment of radar elevation up and down on Coolie Hat Up/down in addition to the axis assignment. This is to make that radar function more “HOTAS-y”. 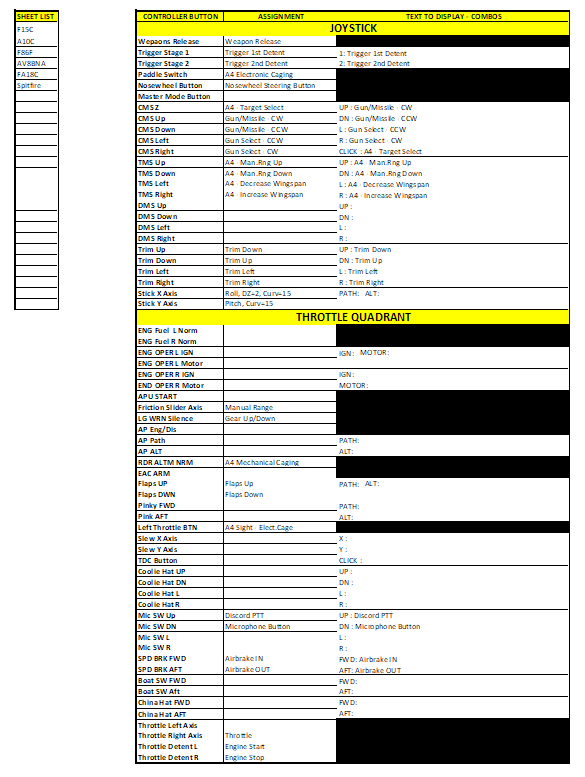 It’s not on this version of the sheet, but I will try to add it later today. The Hornet configuration is otherwise fully “combat ready” in both A2A, A2G plus SEAD (with HARM), Carrier Launch & Land, and Refuelling going well so far. Added reference to Hornet Radar Elevation on CoolieHat for F/A-18C Profile page. Changed the assignments for the TM Throttle Flaps switch UP and DN positions. Down is now “Flaps Half/Full” and Up is now “Flaps Auto/Half”. What this does is whenever the flaps switch is set to the middle (off) position, the flaps switch goes to HALF. You don’t have to double click down or up to pass through half, exactly like the A-10C module works. EAC switch is set to “Probe Extend/Retract” - another useful QOL assignment, this one will extend the probe when the switch in ON (ARM) and retract automatically when the switch is set to OFF. This is contrast to the “double tap” method you have to use with something like the APU, which requires a on-off-on movement to send a second pulse to the game to toggle to “OFF” in game. The RDR ALTM switch now does it’s namesake task. This one does require a double-toggle. The assignment is “Altitude Switch - Baro/Radar”. The fuel flow switches are now set to work the exterior lights switch. Left = On, Right = Off. All updates can be viewed via the link in the OP. Initial Tomcat controls will come later for both seats. Nice find on the new Flaps settings. I’m using China Hat Forward for Chaff and Aft for Flare. Mic Sw Down as a modifier in order to shift the functions for the Right MDI. Throttle’s Pinky Forward for Exterior Lights, and Aft for Undesignate/Nose Wheel Steer (along with the stick’s Pinky Sw). My stick’s Paddle Switch is a modifier for a lot of things. Recently I added it as a shifter for the Left MDI to work the AMPCD. The stick’s CMS is assigned as the Sensor Control Switch. The DMS is the Weapons Select. My TMS is for Padlock and custom snap views to the L&R MDIs. Check out the descriptions of the new Flap control assignments, Wes. Note that the Category includes “Special For Joystick”. There are a few descriptions that have this phrase, including ‘APU Control Sw (special) - On/Off’; I’m going to try this for the throttle’s APU switch. Yes! I’ll have to look more. I bought an extra pack of MFDs and use one for the MPCD and the other is mapped for the UFC as @Franze suggested. It works really well.